Pens are a great item to use as an imprinted promotional give-away since almost everyone requires writing utensils, whether it be to complete office work, write a check, draw a doodle, or simply write themselves notes. Printing your company or organization's name or message on a pen to be used as a giveaway has the potential to be a great marketing and branding tool where the customer will see your message whenever they use the pen for years-to-come. 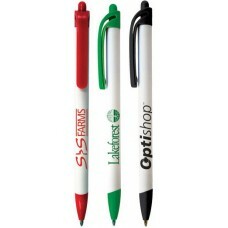 Salesmen use pens as a giveaway to potential customers to keep their name in front of them. Pens can also be used by salesman as a give-away to the gatekeeper to help them get in the door. 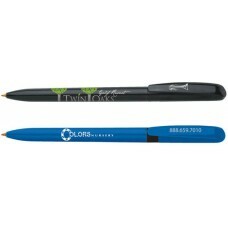 Direct mail campaigns will include a pen for the customer to complete a mail-back postcard. 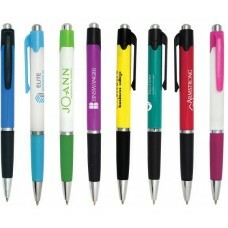 The pens increase the response rate and increase brand-recognition. Schools will give students pens with the school name to promote school pride and encourage note-taking. Banks give away pens for customers to complete checks and deposit slips. Real estate agents will give customers a pen to sign the contract as they are closing the deal. The pen helps the customer remember the agent the next time they need to buy or sell a house. Remember, the average amount of time a person stays in a house in only 7 years. 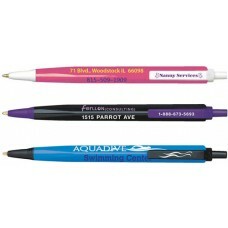 Much, much, more...the possibilities for using pens as a personalized promotional tool are nearly endless! 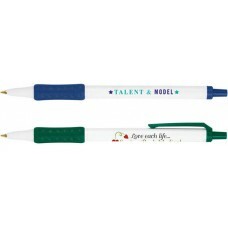 We offer a selection of custom imprinted pens which can satisfy any requirement. Our line of Bic Pens feature the highest quality, most durable design, and best writing quality of any pen on the market.. Our best selling custom pens are the Bic Clic, Bic Clic Stic, and Bic Round Stic. These designs are tried and true and offer an excellent value. If you are looking for a pen that you can be confident will represent your company name with quality and value, the Bic pens are the way to go. The worst possibility is to distribute a pen to a customer that does not work properly, which will represent you company poorly. Alternatively, if you are looking for a budget-priced pen, our Calliope Professional Pen and Carnival Pen have a high perceived value at a low price point. 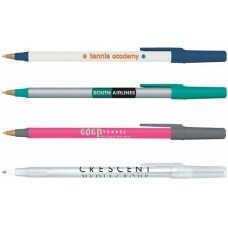 We specialize in offering imprinted pens in bulk at wholesale pricing. Our business has been built over the course of the last 35 years, specializing in selling in large quantities of imprinted products to auto dealerships. Whether you operate in an automotive-related industry or not, you can still take advantage of our low prices and commitment to service. We are able to keep our prices low by specializing in bulk sales. There is a fixed cost associated with starting up the machines to print on pens. Because of this, you will find that we offer very low prices on bulk orders to reduce our downtime and help our customers reduce their costs. Our business-model is based on repeat customers, so we want you to come back again because you are happy with the prices, quality, and service you receive with us. All of our personalized pens are printed using screen printing, which is the most durable and highest quality printing technique available for this product line. Screen printing is performed using a mesh screen, where the areas of the design are open and the non-design areas are blocked out. Screens are produced in reveres, so that when the ink is forced across the screen using a machine, the design is transferred onto the pen in the correct direction. Screen printing is more durable than digital printing, where the design is transferred onto the substrate using a printer attached to a computer. The quality of screen print ink because they are thicker, more durable, and more penetrating. Our pens are printed with durable inks and you can expect your imprint to hold up for years-to-come. When choosing a pen, it is important to consider, not only whether the pen looks good, but also if it will be comfortable for the user when they are writing with it. Users like a pen that writes smoothly and feels good in their hand and allows for quick writing or scribbling. 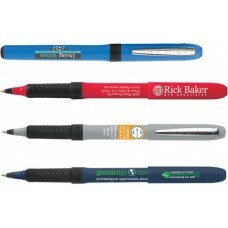 Some people will prefer pens with a rubber grip as seen with the Bic Clic Stic Grip, Bic Grip Roller, and Carnival Pens. Alternatively, some prefer a pen with a triangular shape like the Bic Tri Stic Pens which have a nice feel in the user's hands. Still yet, some prefer a streamlined simple pen; the Bic Round Stic Pens is one of the most basic promotional pens, yet it is extremely comfortable, writes well, and is one of the most popular pens in the industry. When personalizing your pens, it is important to select a design that connects with your company/brand and is also attractive. With the Bic pens, you can select a body color and a trim color, which is nice for companies, organizations, or schools that have 2-color logos. For example, if your school's colors are blue and yellow, consider using a blue body with a yellow trim and a yellow imprint. When you customize your pen, keep in mind that the imprint area is very small. It is usually best to avoid extremely complicated designs in tight spaces as small details can fill in and the overall design can be hard to understand at a small size. 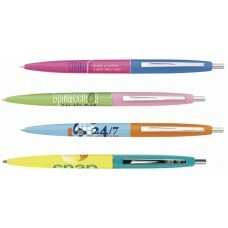 Choose bold design elements that will stand out in the small imprint area of the pen. 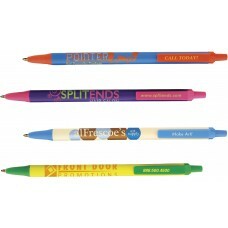 Many of our Bic promotional pens offer the option of an imprint on both the barrel and/or the pocket clip. Sometimes it can be a nice touch to include a logo on the barrel and a saying, brand name, or message on the pocket clip for added branding. 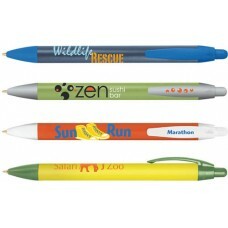 Regardless of the design you choose, we require vector artwork to print your pens. Vector artwork is typically a file with one of the following extensions: .ai, .eps, or .pdf. The tricky thing is that not all files with those extensions are vector files. If you have any questions about your artwork, please reach out to us. There are many different options of pens to choose from, which can be a daunting process. If you need assistance, we can be reached by phone, chat, or email and look forward to helping you make your next promotion a success. Likewise, you can feel free to place your order online in our secure shopping cart with a credit card. After you place your order, our art department will prepare a proof for you within a couple of business days for your approval. Once the proof is approved, your pens will move into production; Once production is completed, the pens will ship to you. We are looking forward to working with you for many years to come!